The sequel to 2007’s Ghost Rider has now released a slew of new media for fans to enjoy. A trailer and poster teases the upcoming film Ghost Rider: Spirit of Vengeance with dark humor and violence. A new look for Ghost Rider and his motorcycle of fire is featured within these looks and the film looks to be a step up from a film of which I had already enjoyed. The film features Nicolas Cage returning as Johnny Blaze (Ghost Rider) as well as other new-comers to the series including Christopher Lambert, Idris Elba, Ciaran Hinds and Johnny Whitworth and is directed by creators of Crank Mark Neveldine and Brian Taylor. 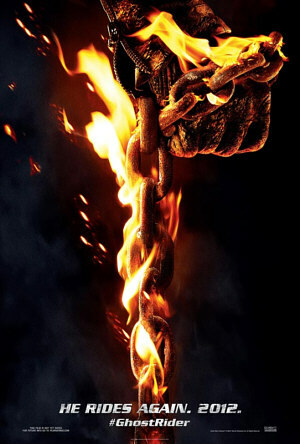 Ghost Rider rides once again when Ghost Rider: Spirit of Vengeance hits theaters on February 17th, 2012. Comments for “Ghost Rider: Spirit of Vengeance” Trailer and Poster Released are now closed.